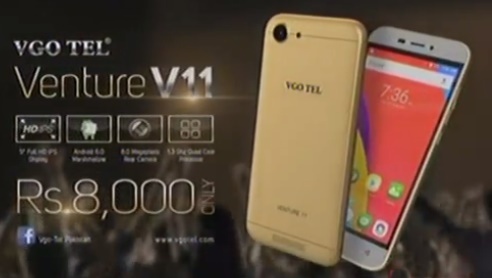 VGO Tel launched its new Venture family handset that is Venture V11 which looks great and affordable from front and back it provide high speed performance to its users and easy to grip body which avoids from any damage. Venture V11 holds 1.3 Ghz Quad Core Processor, 2 GB Ram, 16 GB internal storage with extendable through MicroSD card and 5.0 inch IPS Display, 6.0 Android and many other excited features. 8 Mega Pixel 3264X2448 Panorama mode, HDR, Scene mode, self-timer, LED Flash and 2 MP Front camera.